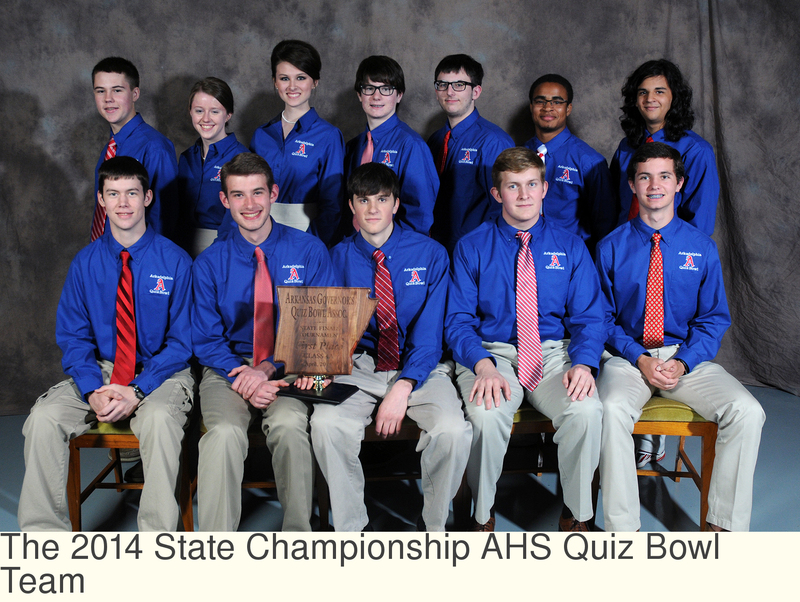 Arkadelphia High School’s Quiz Bowl team brought home their third state championship as well as $3,000 in prize money on Saturday, April 26, defeating Maumelle High School 335-185 on live television. The match was broadcast from AETN’s studio in Conway. “This quiz bowl win represents the culmination of successful teaching through our overall ‘K’ through 12 experience." AHS jumped to an early lead and carried the momentum through the match. AHS excelled at this critical strategy and consistently beat Maumelle High to the buzzer, allowing AHS more opportunities to answer correctly and build their lead. Although they sailed through the match, senior Dalton Huerkamp said keeping their cool was not as easy as it may have appeared on TV. Senior Seth Daniell said the momentum AHS built early in the match helped them stay quick on the buzzer and keep Maumelle High on their heels. In round one, where 20 toss-up questions are answered by individual team members, McMillion, Daniell, Huerkamp along with Chase Masters developed an early lead by racking up a lot of unanswered points. AHS maintained their lead in round two. Sierra Westberg joined the match as both teams struggled to provide correct answers to several challenging questions. Maumelle High made up some ground in round three. With AHS’s starting four back at the helm, Maumelle proceeded to answer nine of ten lightening round questions correctly. One more correct answer and they would have tightened the gap significantly. “We were really relieved when they missed their last one,” Daniell said. Matt Savage, Julie Williams and Devan Moses entered the match to close out the fourth and final round for AHS, who only needed to maintain a comfortable lead in order to take the win. And while the state championship was perhaps the biggest cause to celebrate, it wasn’t the only occasion Daniell was celebrating that day. His birthday was also the same day. Patterson attributed the team’s success to their solid academic backgrounds as well as their dedication and hard work. Over the last two years, four of AHS players attended the Arkansas Governor’s Quiz Bowl Association (AGQBA) camp. Patterson said Daniell, McMillion, Savage and Westberg benefitted from their experiences at the camp. We’ve been working to get back to finals for many years. The stars aligned this year and we had the right talent and the right questions. We are grateful for the support we received from the parents, teachers and administrators,” Patterson said. Arkadelphia High School serves 9th-12th grade students in the Arkadelphia Public Schools, Clark County, Arkansas - Home of the Arkadelphia Promise. AHS is a regional STEM Works leader, and was named by the Washington Post to the top 1 percent of the nation's most challenging high schools.